'Mixto con huevo" vs. 'Uitsmijter"
Now here is the Dutch version: 'uitsmijter', pronounced outs-my-ter, more or less. And I dare to say this is the Dutch deconstruction of the Spanish 'mixto con huevo'. The slices of bread are not grilled and the ham goes on top of them and then the egg. The cheese is optional and goes on top of everything so it is not covered with more bread. Pero he aquí la versión holandesa: 'uitsmijter', pronunciado algo así como auts-mai-ter. 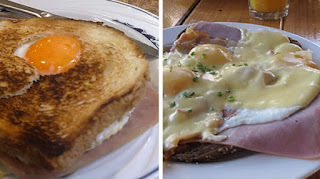 Y me atrevo a decir que los holandeses han hecho la desconstrucción del sandwich mixto con huevo. El pan no está tostado y sirve de base al jamón y al huevo. El queso es opcional y va encima del todo, por lo que no se cierra con más pan. You need to research the croque madame (with egg), corque monsieur (without) and croque cannibal (with filet americain)... :) they are older (1910) and were originated in Paris. Hole-> corrected. I read it 20 times thinking "there's something wrong in this sentence". It is the consequence of updating so late at night. Thank God I've got you! Want a job in the editorial field? I like this post! It opens my appetite. I think this weekend I'm going to prepare some uitsmetjer. Also to remember the good time spent in The Netherlands. Yummy! @Manuel, ooooh cómo tú por aquí y con este comentario tan original :-) Ya los probamos dentro de muy poquito, dos semanas! Un beso. Hello, I believe your internet site may very well be possessing browser compatibility problems. When I appear at your internet site in Safari, it seems very good but when opening in World wide web Explorer, it's some overlapping. I just needed to provide you with a speedy heads up! Other then that, great web site!